* - Only the funds deposited after November 10th 2016 are taken into account for getting access to StrategyQuant products. The funds deposited prior to November 10th 2016 are not taken into account. ** - To retain access to StrategyQuant products after the first month, your trading volume has to be at least 5 standard lots per month. This E-book contains detailed instructions how to work with StrategyQuant software, explains basics of creating and testing strategies, and features information about all necessary software settings. 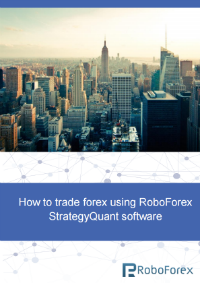 RoboForex bears no responsibility for the information provided by StrategyQuant websites and applications, or potential losses resulting from the use of StrategyQuant products. Any forecasts, recommendations or other information provided by StrategyQuant products should not be considered as investment advice.